Original message: File does not exist. I have the same problem, Ubuntu 10.04 64bits up-to-date 2010-05-17. I know this is not the right place to discuss about VisualVM bugs, but the I think it's fair to expect that the pkg installed from repo should work. To Hendra - you are right. Do not discuss VisualVM bugs here. You can use VisualVM issues tracker or mailing lists for such purpose. a locally running Java app later. the jdkhome option does not seem to work correctly. We need to be clear about the issue though because I had slightly different symptoms (maybe Ekr can clarify). 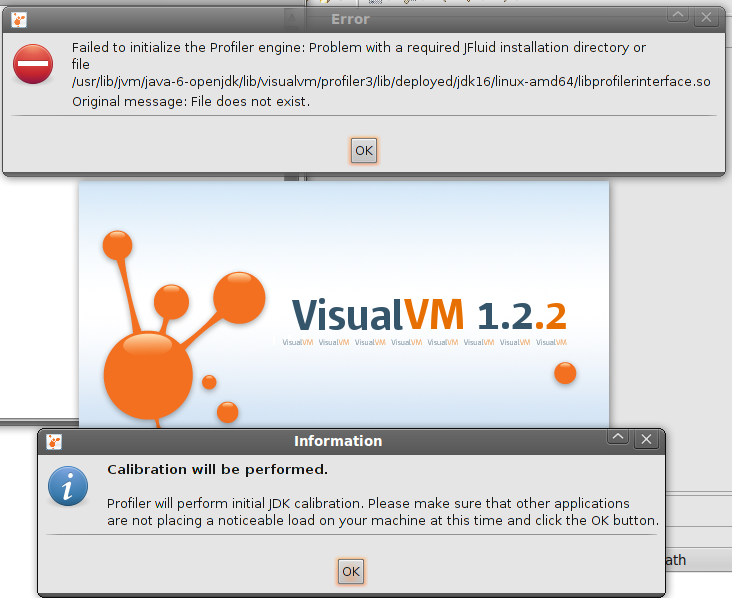 With the standard OpenJDK installation and its visualvm (packages default-jdk and visualvm), jvisualvm starts up for me with the Fluid error. However, I can still then look at running or launched Java apps. I presume the Fluid stuff is just doing the calibration like the Sun one does. Ekr's workaround is to switch to the Sun jvisualvm and JDK, and so isn't actually working round the OpenJDK jvisualvm bug as such (i.e. it's really switching apps, not working round the bug). I can confirm his issue with the Sun install not changing the jvisualvm symlink. I assume that this should be a separate bug then (**but can a dev please confirm that this is what they'd prefer and what project it should be under; sorry, I'm a bit of a noob!**). Since there are update-alternatives entries for java, javac, javadoc, rmiregistry, etc. (but not for jvisualvm), I assume the correct fix is for a jvisualvm update-alternatives to be added and incorporated into the Sun package install process. Ah, sorry, an update. The visualvm package is used for the common launch script for either JDK (and is recommended from the sun-java6-jdk package, hence I presumably had it pre-upgrade but it updated as part of the Lucid upgrade). The symlink issue is part of bug #657408, and I'll update it there with an x-ref to this one. This appears all tied off now, but just to say there was a typo in my comment #10: I meant bug #657048, which documents the fix that is supposed to address this bug as well.